Turn your head for one minute in the garden and suddenly your zucchini turns into a monster the size of your arm. These huge vegetables are not so good for fresh eating, but make GREAT zucchini bread. You can even shred a whole bunch of it to keep in the freezer for chocolate bread whenever you feel like it. I LOVE this recipe because it tastes like a brownie. YUM! Also, it makes a great gift because who doesn’t like chocolate? Step 1: Preheat oven to 350. Grease loaf pan(s). Step 2: Squeeze excess moisture from zucchini. Step 3: In mixing bowl, combine oil, sugars and vanilla. Step 4: Mix in eggs and squash. Step 5: In separate bowl, combine flour, cocoa, baking soda, baking powder, salt and cinnamon. Step 6: Add dry ingredients to wet ingredients. Mix until just combined. Step 7: Fold in chocolate chips. Step 8: Pour batter into loaf pan(s). Step 9: For mini loaves bake 30 minutes. For regular loaf bake 45 minutes or until knife comes out clean. Preheat oven to 350. Grease loaf pan(s). Squeeze excess moisture from zucchini. In mixing bowl, combine oil, sugars and vanilla. Mix in eggs and zucchini. In separate bowl, combine flour, cocoa, baking soda, baking powder, salt and cinnamon. Add dry ingredients to wet ingredients. Mix until just combined. Pour batter into loaf pan(s). For mini loaves bake 30 minutes. For regular loaf bake 45 minutes or until knife comes out clean. Could you substitute the oil for something else, like applesauce or Greek yogurt? I believe that would work fine, but I haven't tried it in this recipe. Hi! I used Coconut Oil in mine and it turned out wonderfully! Yes. I used 1/2 cup of applesauce and it turned out great! We made this last night and everyone LOVED it!!! Tasted like a yummy moist chocolate cake!! Will be writing this receipe down for the receipe box!! Thank you!! I used applesauce instead of the oil and I used 1/4 cup of brown sugar and 1/4 cup of regular sugar and it was great! Loved it! This cake was amazing. My neighbor had given me zucchini so I searched for a recipe and chose this one. So, glad I did! Took her a few pieces and she asked for the recipe as well. Just plain yummy! A fantastic recipe! I was gifted some enormous zucchini, and they made wonderfully moist mini breads. I did have to bake for an extra ten minutes: so 40. Thanks so much for sharing this recipe. Can you us self rising flour? Do you know what the calories might be on this recipe? This is the best chocolate anything anywhere - you have to try this! This was really good! I will definitely make it again. I didn't use white sugar. I used 3/4 cup of brown sugar instead, apple sauce instead of oil and 1 cup of oat flour instead of white flour. This recipe is such a hit for me. I sub the oil and eggs with applesauce and use dairy free chocolate chips to make it vegan. 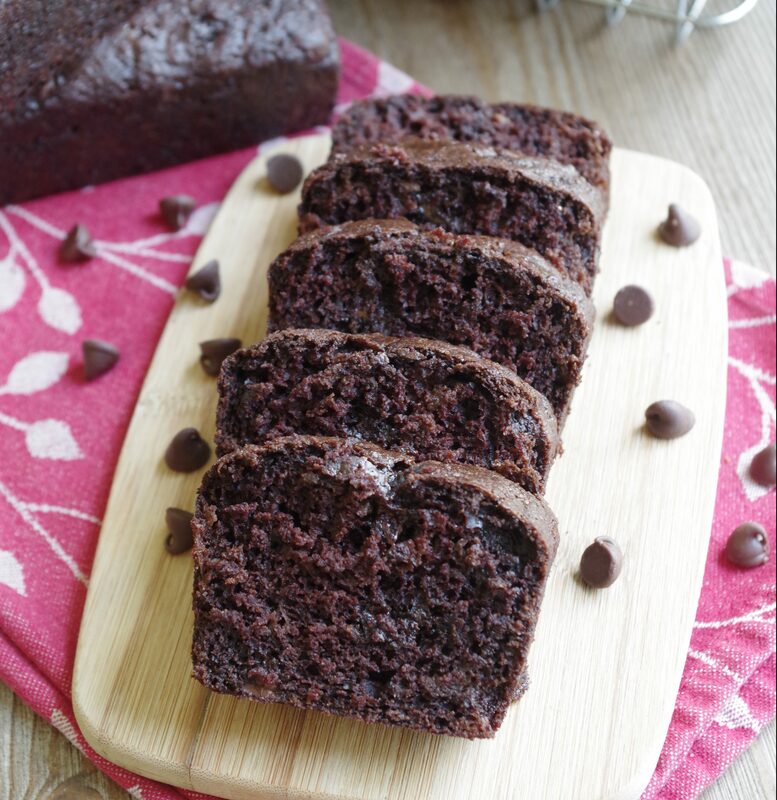 It makes such a moist loaf that is full of yummy, chocolatey goodness. I made the mistake of bringing it to my office once, and now my coworkers can't stop asking me when I'll make more. I was even given some zucchini by a coworker so I get to it quicker. Hah! 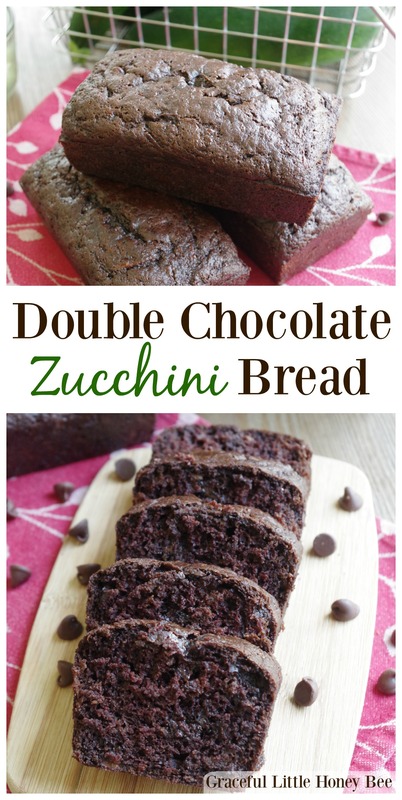 Your Double Chocolate Zucchini Bread is our new favorite!! So delicious and easy to make. Made it this evening; followed your recipe exactly. Had some warm - oh wow, so good! Had some later with vanilla ice cream. Hubs loves this - going to make it all summer long!! I made this today, and oh my goodness! It is delicious! If you haven't tried this recipe, do it. you will not be disappointed. I absolutely love this cake! I was wondering if it’s possible to bake it in a 9 inch round pan provided I double the recipe. Please let me know! You could make it in a 9 inch pan, but I wouldn't double it unless you are using 2 pans. Made this following the directions except I did not squeeze excess water from zucchini and it was delicious. Deep chocolate flavor. Will make this again. Easy shredding if you have a Cuisinart. I have made this many times over in both a gluten free version and just as it is printed here Excellent both ways. Thanks so much. This is delicious Missy, thank you! I didn't even tell my son it has zucchini in it! Thanks you so much, the best zucinni bread I have ever made! Delicious. I doubled this and used a bundt pan. I would throw an extra handfull of chocolate chips in next time...there will be a next time.